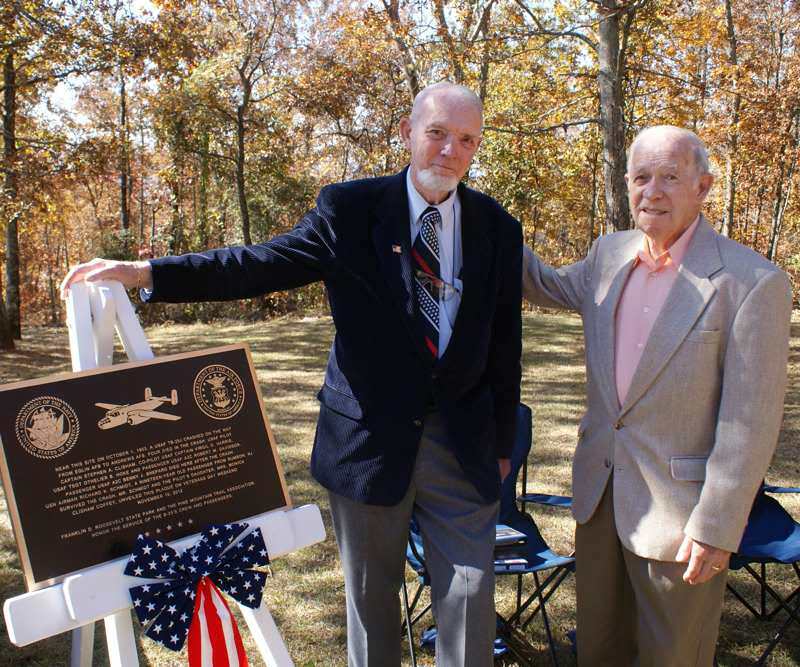 First of all the PMTA wants to thank the Ledger-Enquirer for the Sunday November 4, 2012 extensive article that Jim Mustian did about the plane crash on Pine Mountain in 1953'. His detailed reporting was interesting to all who read it. Many who read this said he deserves an award. The article brought to light to the community about the crash and notice of our memorial event we had Saturday November 10, 2012. Our attendance was more than ever expected likely due to the article. It would take way to long to tell how wonderful our event went. The survivor of the TB-25J crash on Pine Mountain Richard K. Schmidt and his wife Janet arrived at FDR State Park mid afternoon Friday. To his surprise his daughter Ellen from New Jersey and son Rich from Ohio knocked on his cabin door shortly afterwards. The daughter of the pilot of the plane (Monica Clisham Coffey- daughter of USAF Capt. Stephen A. Clisham) came with her husband Dennis (and her son Sean). They arrived Friday. Thursday the sister of the pilot (Mary Martino and her husband Emil) and brother of the pilot (Ron and wife Marge Clisham) flew in and stay at nearby cabin. Our goal was to get both families together Friday afternoon late and we did. 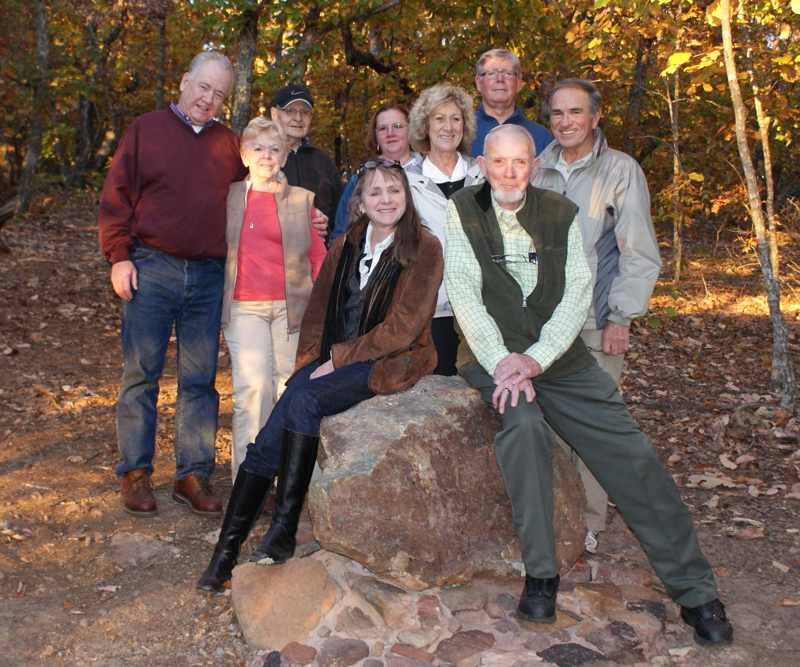 My wife Helen and I met the families at Dowdell Knob Scenic area. They were amazed at how beautiful the view is from there. We then had an emotional walk down into the woods along a road we cut recently, toward the crash site. It was there as a group the two families related to one another for the first time about their lives and how the crash affected them. Saturday morning to my surprise there was already a number of folks at Dowdell Knob by 8:30. Thanks to the staff of FDR State Park along with Joe Skinner, Ronnie Heard, Ed Jones and others of the PMTA for making sure things were ready. Joe also for making photos along with Debbie Smith and video from Mark Swann. By 9:45 there were a couple hundred guest there to meet and greet our honored guest, the Schmidt and Clisham families. What a warm welcome they got too. We started the 10 a.m. program with my associate pastor retired USN LT. Commander Norman Drummond calling forward the Central High School Navy ROTC color guard to post (under the director of Chief Dudley). Then he lead the group in pledge to the US flag followed by a heart warming prayer. A couple minutes later a vintage T-6 aircraft piloted by John "Skipper" Hyle of Peachtree City did three passes overhead. Mr. Schmidt got up and remarked he worked at Pennsacola Navy on a T-6 then said "there were covies of them at Whiting." I remarked that according to the flight log of Capt. Clisham, he had a number of hours in a T-6. Then on to presenting /reading letters and certificates to the survivor and daughter of pilot. We had a US flag flown over the US capital on Oct 1 (the 59th anniversary of the crash) with certificate for Schmidt. Letters from Congressman Westmoreland were read (one to each.) Milton Jones read the certificate for a Georgia flag and I letter about a USAF flag flown over a veterans park in Griffin, GA, we presented to Monica Clisham Coffey. Sen. Josh McKoon read/presented his letter to Monica regarding her dad. The most inspirational letter to all veterans and directed to Schmidt and Monica was from the commanding officer of Whiting Field NAS. Whiting Field was where Schmidt was stationed at the time of the crash in 53'. Ronnie Heard, USAF veteran read that letter and presented it to Schmidt. We then had Monica and Richard unveil the bronze memorial plaque. The beauty and wording on the plaque struck both Richard and Monica speechless and teary eyed. Emotional remarks and thanks Mr. Schmidt made and then Monica Clisham Coffey concluded with her heart warming thanks and beautiful poem that was in her Dad's flight school book. 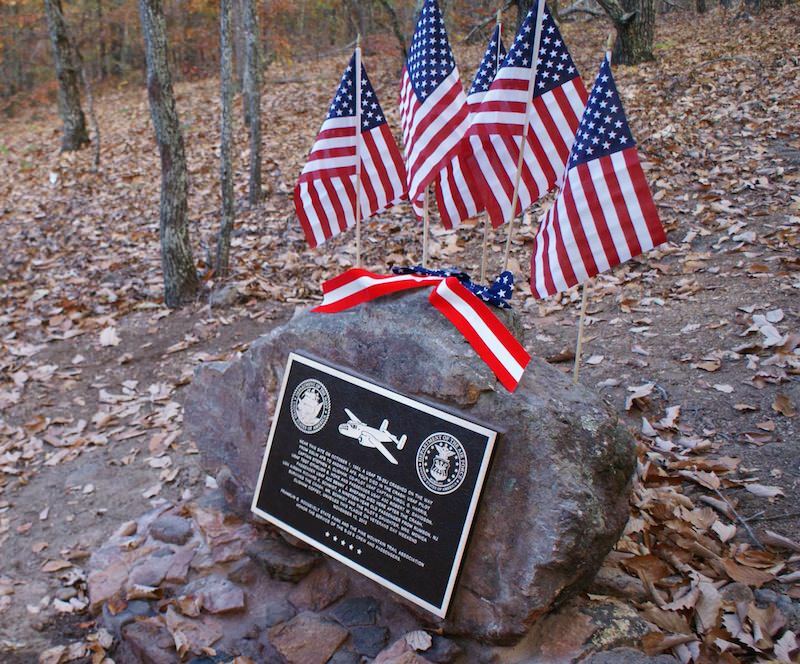 After the conclusion of the ceremony we took the families and the bronze plaque to the rock/crash site (just 850' from Dowdell Knob on the Pine Mountain Trail) and temporarily placed it on the rock for photos. Later we treated the families to a " Country's BBQ picnic" lunch at the rock shelter near the historic Liberty Bell Pool, complete with a fire in the fireplace to knock the chill off (thanks to Ed Jones.) Both families later took a complete tour of the Little White House area. All left for home Sunday. Both families were so thankful for all we did to make the weekend special for them. We truly thank Desmond Timmons and David Jordan as managers of FDR, DNR Region Manager Eric Bentley and DNR Judd Smith and the FDR maintenance staff for making sure all was ready for the event in every way.Thanks also to FDR enforcement ranger John Mulligan and the Georgia State Patrol officer who manned the gate to Dowdell Knob (directing those to the event. ) The four most memorable things to me over the two days: Number one was when Richard shook hands with Lee Wadsworth (of Manchester) for the first time in 59 years (Lee was the first to aid Richard the night of the crash and visited him at Martin Army Hospital on the following Sunday). Second was Monica (with tears in her eyes) and her family being shown in the woods where her Dad perished. Then after the ceremony when we placed the plaque on the rock, the look on Ron Clishams face, wearing one of his brothers medals, kneeling by the memorial rock and plaque. Lastly Friday afternoon while we were in the woods, there was the most beautiful sunset I'd ever seen on the Pine Mountain Trail. The bringing together these two families allowed new insight about the crash to be shared. For Monica Clisham Coffey (who was less than two when her Dad crashed) it provided her and her family some closer to her Dad's death. For Richard Schmidt, his son, daughter and wife, they were able to share for the first time over the last three months details of the crash Richard had never discussed. For Schmidt the event gave honor to his service and thanks for his survival. For Capt. Clisham's family he finally received the thanks and recognition for his service and ultimate sacrifice. On Sunday, November 11th, the memorial plaque was installed on the rock, allowing now and for all who visit the area to know of the crash and in remembrance of those who died there and Schmidt who survived.The five flags flown on Sunday were in memory of the five who died in the crash. From now on, these flags will be placed on the rock each Veterans Day, Independence Day, Memorial Day and on October 1 (the anniversary of the crash). In the FDR State Park office is now a book containing detailed information about the crash.